Use Mecha'Thun instead if this is your game plan. You can play this and Myra's in the same turn with Prep for what that's worth. And we've seen things like Dragon Caller Alana be played (and often at the literal end of the game). So I wouldn't count this card out right away. What´s a Neurtal Legendary ? 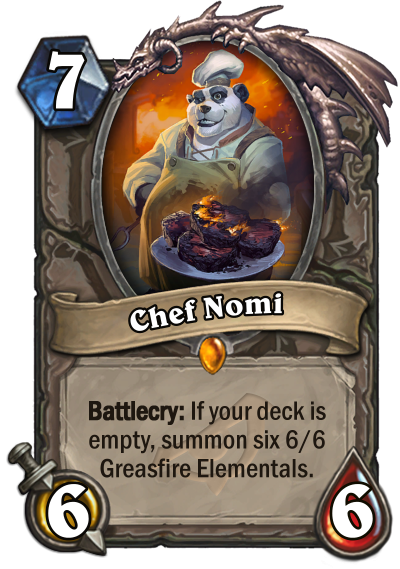 I wonder if a Myra's Unstable Element / Chef Nomi deck will be a thing. It didn't work with Mecha'thun cause rogue can't realiably kill it but maybe with other unrevealed cards it might be a thing. I could see this with Shudderwock. You play this whenever then get a big boost the turn you drop shudderwock. Gonna need a ton of draw, but, it seems like there is potential there. Could be cool in Odd Rogue maybe. Well, he is faster than Mecha'thun in Myra's Unstable Element rogue decks whatever that means. I guess if you bounce it somehow, you might get a stronger neutral Alana, though that's pretty slow and some decks (control priest, warlock, warrior) will save their best AoEs for that turn. We need to see the rest of the cards to see whether the Chef can be included. At least CheeseEtc will get an inspiration for his Chef class. Baku is leaving standard. If you meant wild, then this might be too slow in that format. I think this might actually be a total cancer deck. I think people are underestimating Myra's + Nomi. Its disgusting and more consistent than you might think. How can they even dare to bring this ancient evil back and his "flame raped" meat!!! Probably not very good but interesting nontheless. If your opponent has an answer you are fucked though. I am definitely gonna throw him in Kingsbane Rogue as a last stand card. I already love the card. Perfect flavor too. It is hard to think about this card viability yet, pirate rogue is kinda already a thing, if we get engine draws like Elven Ministrel this might be a thing, considering a 7 mana 42/42 is basically game if you are not a warlock. Then again tempo rogue loses a lot this expansion. I don't know how that slipped my mind. This seems too slow for a regular Myra aggro rogue deck. Tempo rogue maybe?